I absolutely love summer! And boy is it in full swing! I could do without the blazing temperatures and the humidity, which turns my naturally wavy hair into a frizzy mess (think 80's perm). But I am loving time with my family, swimming in the pool, and one of my all time favorite summer time activities, putting up vegetables! Yes, you read that right. I love preserving the food that we grow, whether that means freezing it or canning it. For me it brings back memories of getting together with my grandparents and sometimes my aunt and uncle, and sharing in the work. It was always so much fun, and after the day was done, we would split the food that was preserved between the families. All winter long we would enjoy the good food that we grew. It was almost like having a little taste of summer during the bleak cold winter days. I thought I would share with you how to preserve sweet corn on the cob so that you too can enjoy it all winter long! First, I have something that I must confess. I didn't actually grow this corn. 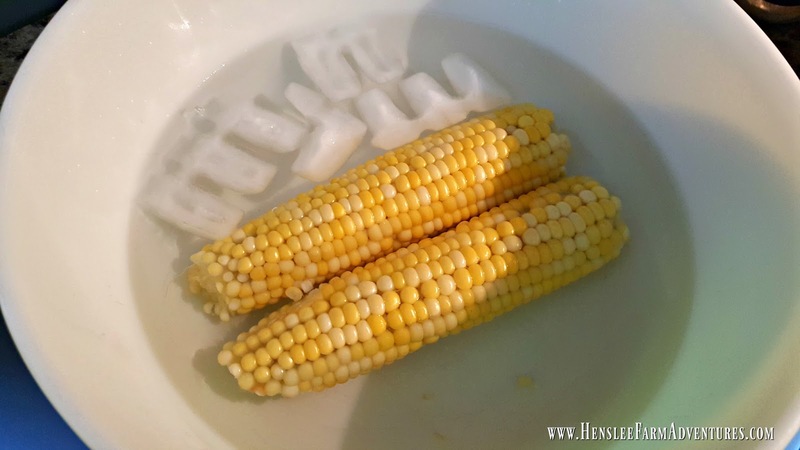 We have tried growing sweet corn for several years and we have just not had any luck. In fact the best year we had for corn was one where we were able to harvest 6 ears! I have to give a shout-out to the wonderful lady that grows the corn that I froze. Her name is Sherri and she has a corn farm. 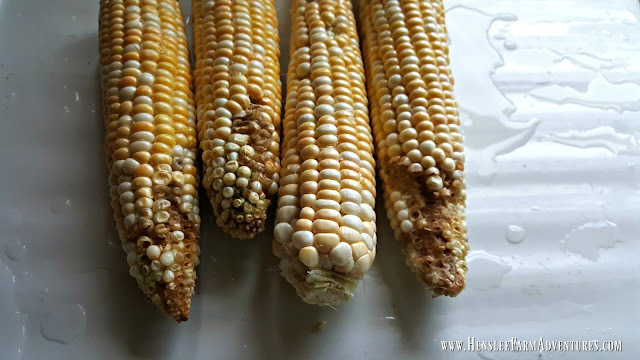 It is called Farm House Corn. It is absolutely wonderful corn, and she is the sweetest lady! What I love is that she only raises non-GMO corn and she uses no pesticides! I love it when you find a farmer that has the same ideals as you. Check-out her website, she is just starting her business (I am NOT getting paid to say any of this). Now, back to freezing corn. I used to think that you could just wash your veggies and put them in a freezer bag and you are done. 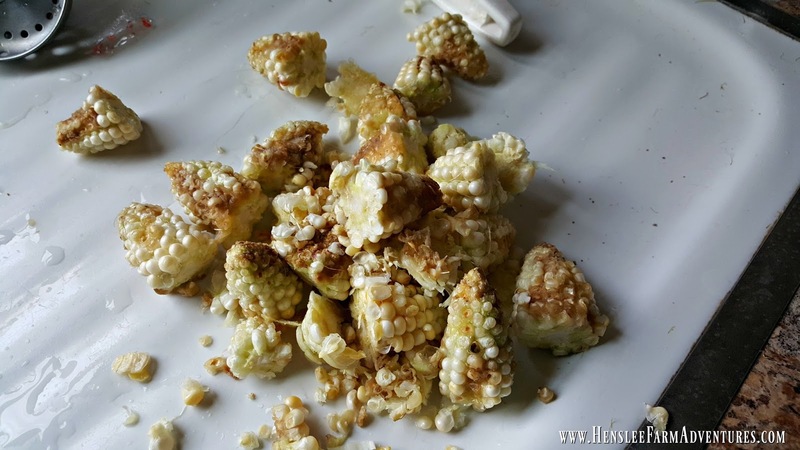 With some veggies you can do this, but with others, corn being one of them, you have to blanch it first. Blanching is where you partially cook vegetables, then dip them immediately into a cold water bath to stop the cooking process. Once the vegetables are blanched and dry, you can prepare them for the freezer. The first step is to shuck the corn and remove the silks. To remove the silks, scrub (not hard) with a vegetable brush while the corn is in cold water. Beautiful corn, with slight blemishes. I love it! To me it means no pesticides. Once the silks have been removed, cut off any bad places. I thought I would share this picture with you. 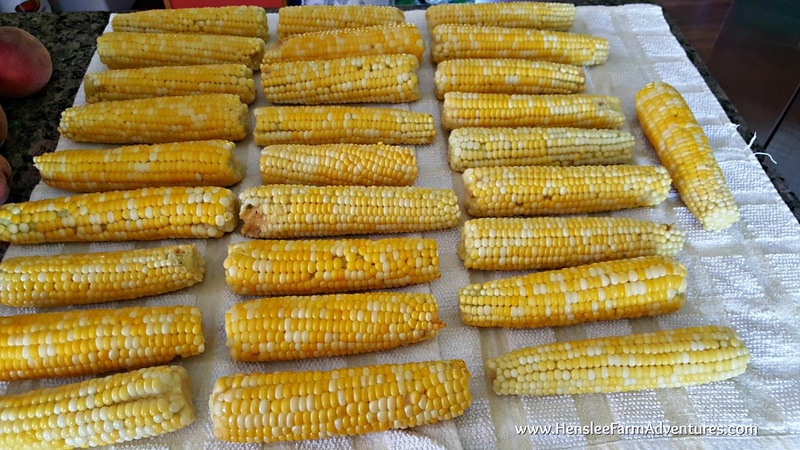 The majority of the corn I got was pretty much perfect, however there were some that looked like the picture above. To me, that shows that pesticides are not being used. I just cut off the tops and we were good to go! A treat for my chickens! Next, bring a pot of water to boil and put in as many ears that will fit and boil for 6 minutes. 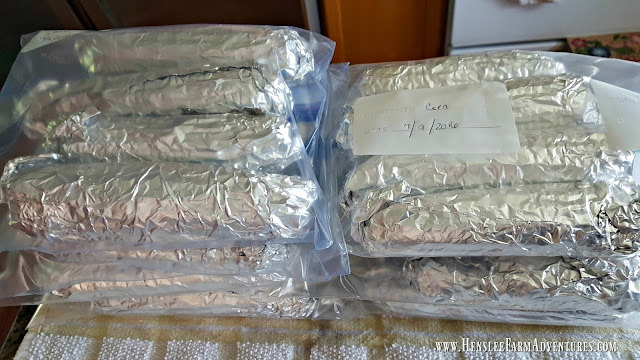 Unfortunately, I do not have that big of a pot, so I had to boil my corn in batches of four. As soon as the 6 minutes are up, you need to immediately immerse the boiled corn in a bowl of ice water. The ice water will stop the cooking process. Isn't the corn a beautiful yellow? And yes, that is two colors that you are seeing. This corn happens to be a bi-color corn. Lay the corn out on clean kitchen towels to dry. Beautiful corn! I believe that is a peach photo bombing this picture! Once the corn is dry, you can roll it up in foil, and put it in freezer bags. After that all that is left to do is put it in the freezer! Ready to freeze to eat this winter. 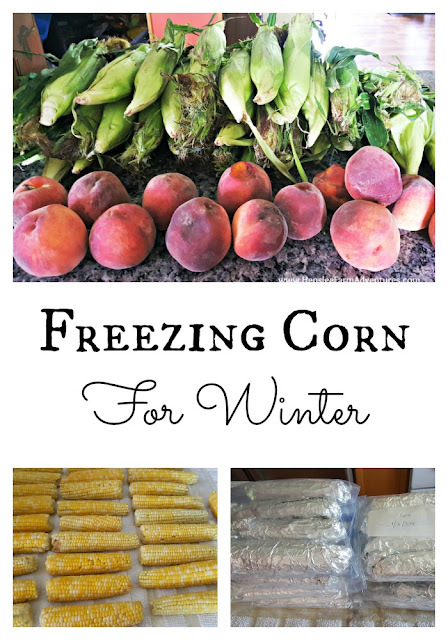 There really isn't much to getting corn ready to freeze. My kids love corn on the cob, and this winter, we will enjoy this corn. We can also thaw it and cut it off the cob and use it for stews and soups. It will give them a fresh from the garden taste! 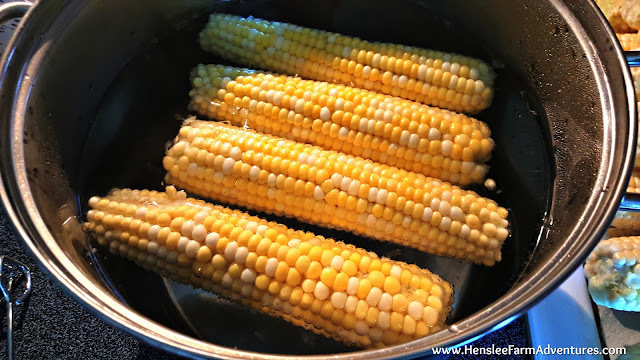 Trust me, after trying this, you won't want to buy canned corn again! Be sure and let me know in the comments below what vegetables you preserve for winter.